After a canceled flight and an unscheduled night in Chicago, I finally made it to Sao Paulo at 3:30am on Wed morning. This made for one really long day of meetings and since they do not eat dinner until 10:30pm (and took us back to the hotel at 3am) needless to say, I was just a little exhausted. 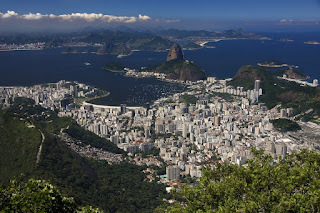 No time for photography in Sao Paulo, so it was off to Rio De Janeiro at 8am for another two days. One full day of meetings and then half a day to go shoot. The picture above was taken from the statue of Christ which looms over the city. The weather cooperated with me since the previous days had all been overcast and it cleared for my free afternoon of shooting.